Even with the apple crop being so early this year there are still many apple varieties at the farmers markets and in the local grocery store. 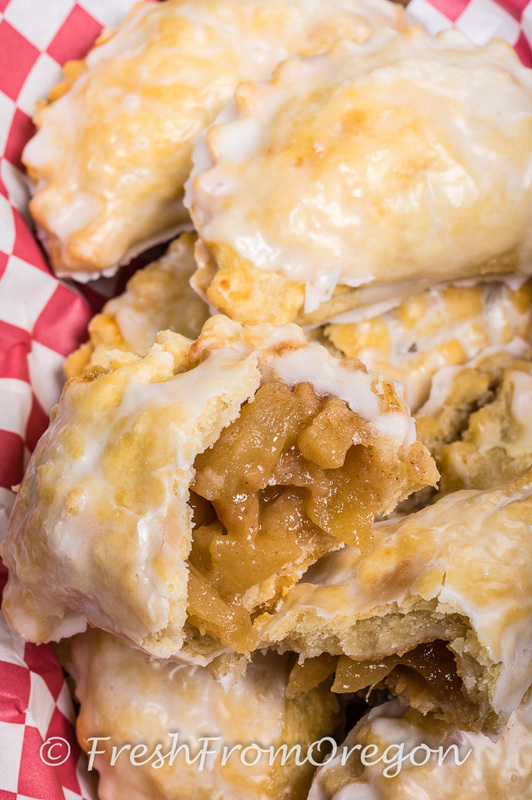 Here is a flaky little treat to make and it fits in the palm of your hand, Apple Hand Pies. 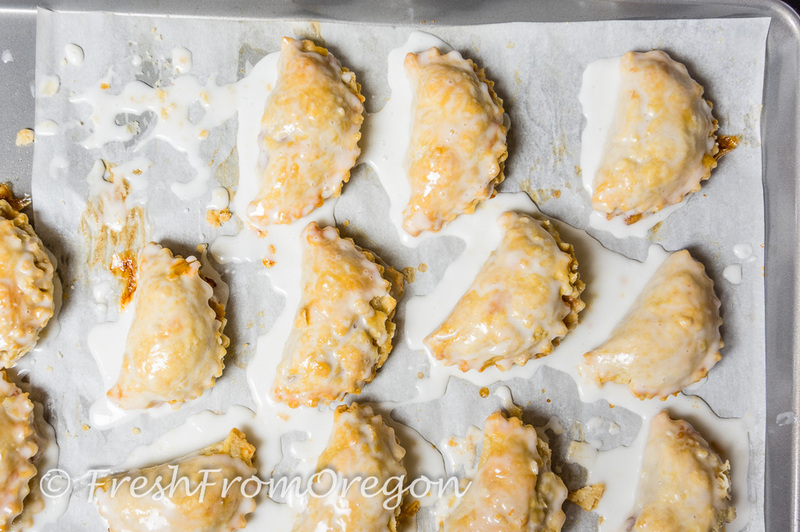 Here is a homemade version of the little pies you probably remember you had in your lunch box growing up. With just a few easy steps these little pies are simple to make and perfect for those small little hands in your family, no fork needed. Preheat oven to 425F. 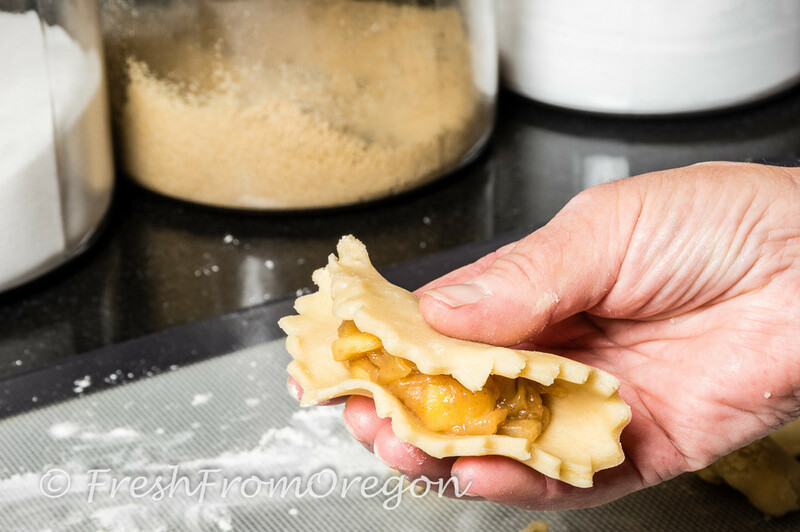 Remove pie crusts from package and allow to come to room temperature while you prepare filling or prepare homemade pie crust. Peel and dice the apples. In a large skillet, melt butter over medium high heat. Add apples, salt, nutmeg, brown sugar and cinnamon. Heat for about 5-10 minutes, until apples are soft, stirring occasionally. 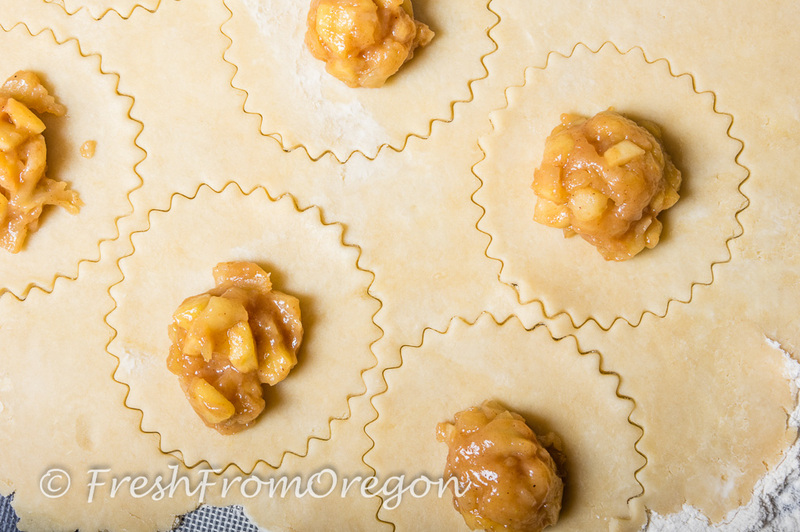 While apples are heating, unroll pie crusts and cut 6-7 circles from each crust (using a 4 inch biscuit cutter). You may have to roll scraps to get the extra circles. Set aside. 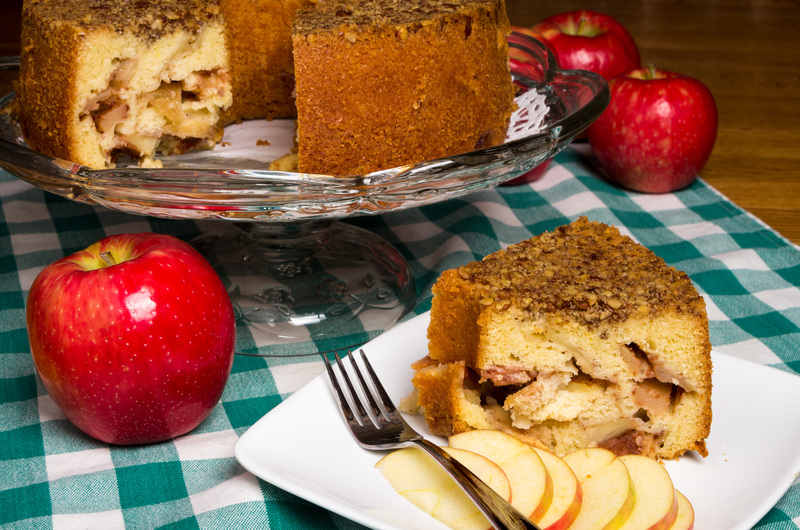 After apples have softened, sprinkle in flour. Heat for an additional minute, stirring thoroughly. 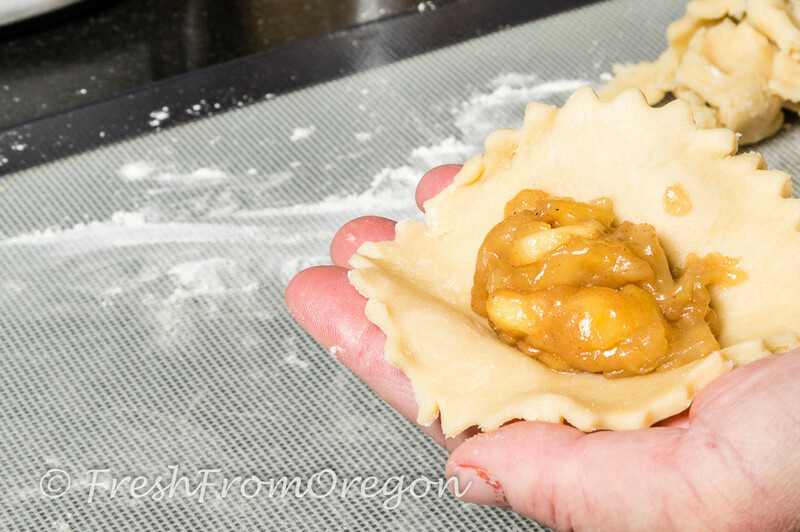 Using a 1 tablespoon scoop, drop apple mixture into center of each pie crust circle. Fold in half and pinch edges COMPLETELY. Fold pinch edges over. 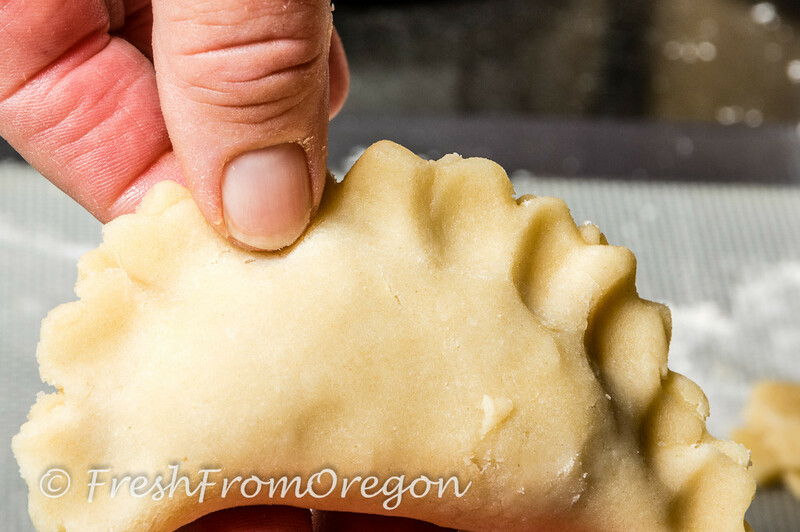 Poke hand pie with tines of a fork to prevent bursting. Beat egg white in a small bowl. Brush over the tops of each pie. 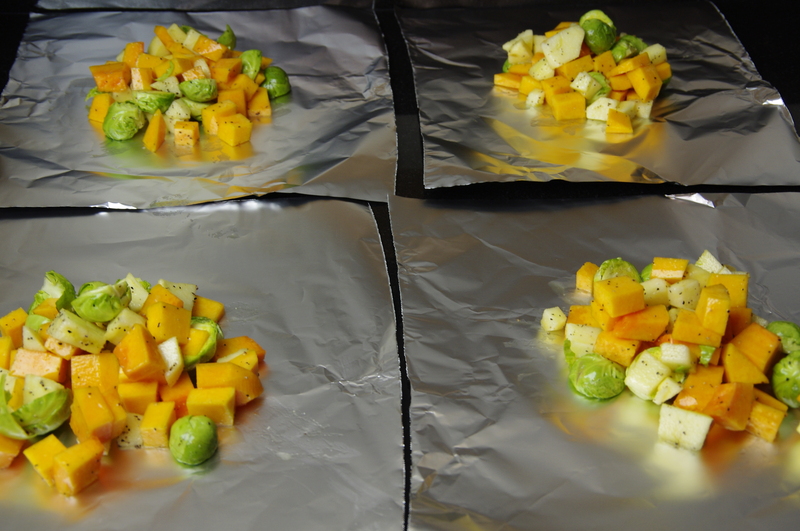 Bake on a parchment paper lined baking sheet for 15-20 minutes, until lightly browned. While pies are baking, whisk together the glaze ingredients. Remove cooked pies from baking sheet and drop in glaze, coating it completely. Return to parchment paper and allow to set, about 10 minutes. Enjoy warm or cold. If the word homemade jelly makes you think wow that’s a lot of work and looks so hard to do I am here to change your mind. 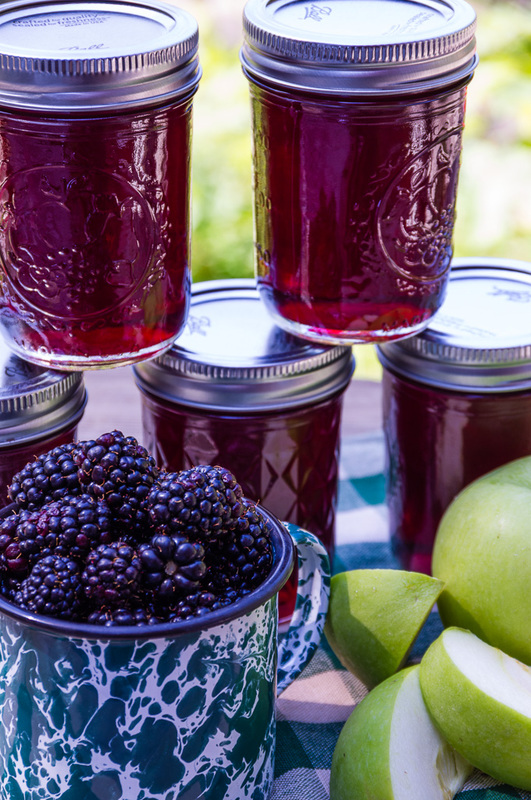 I have been making my own jam for 30 years and I always thought jelly was a lot of work until I decided I was going to give it a try last year. At first I went to the store and bought a jelly strainer with the washable cheesecloth and started to make my first batch. 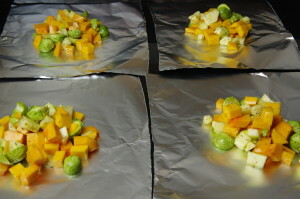 It was easy to take the fruit, add some water and let it cook down for about 5 minutes. So with my cheesecloth lined strainer I added my fruit and juices only to discover the store bought metal strainer was not as sturdy as I thought and the cheesecloth did not hold all my cooked down fruit. I did eventually get all the juice into a bowl and made my first jelly but I needed a better way to strain my juice from the fruit. One Saturday morning my husband and I went to an estate sale and there in front of my eyes was a vintage jelly strainer. For $5 I could not pass it up and had to give it a try. 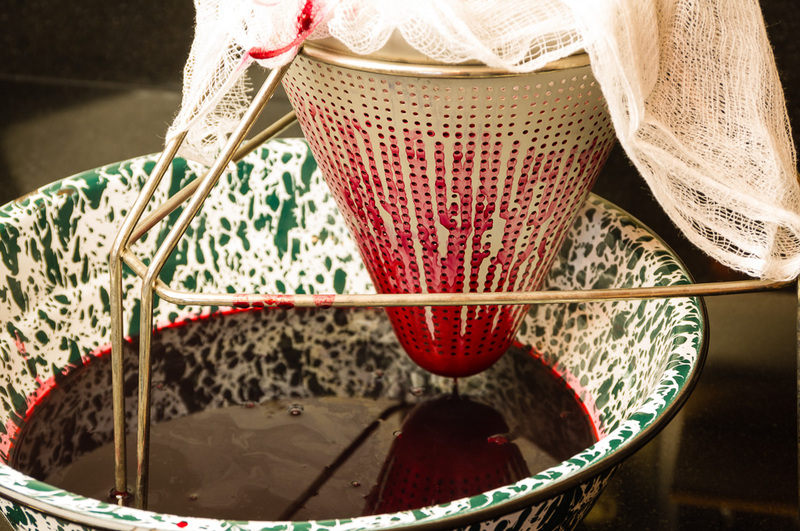 After making my first batch of jelly in this vintage jelly strainer I was hooked. I have found 2 more since at estate sales and sometimes I have 3 different batches of jelly going at one time. 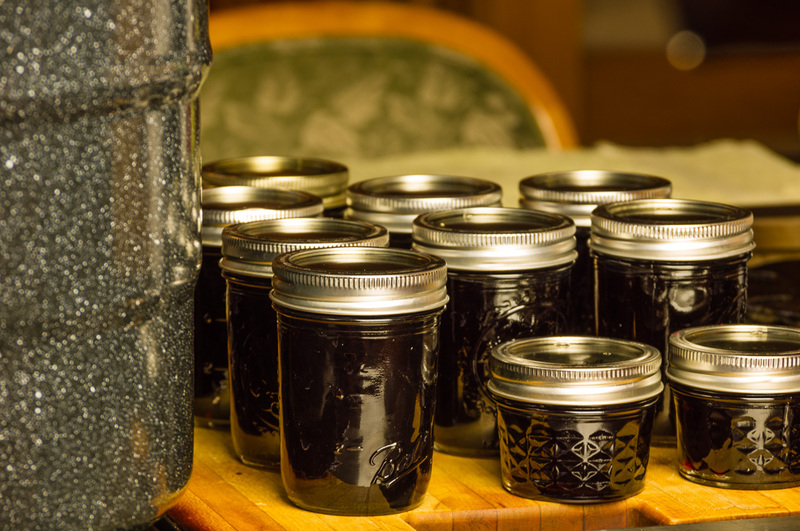 With blackberries Fresh From Oregon this week it was time for me to make a batch of blackberry apply jelly. So if you have been thinking about making homemade jelly just hit a few estate sales and come home with your own vintage strainer and get started. In large sauce pan, bring blackberries and 1 1/4 cup water to a boil. 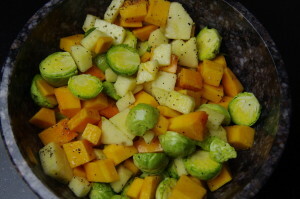 Reduce heat and simmer for 5 minutes. Line a stainer with a double layer of cheesecloth and place over a bowl. Place berry mixture in strainer and let stand for 30 minutes or until you think all the juice has strained out. Reserve the juice and discard the pulp. Remove and discard the stem and blossom ends of the apples (do not peel or core), cut into small pieces. Place in large saucepan with just enough water to cover. Bring to a boil. 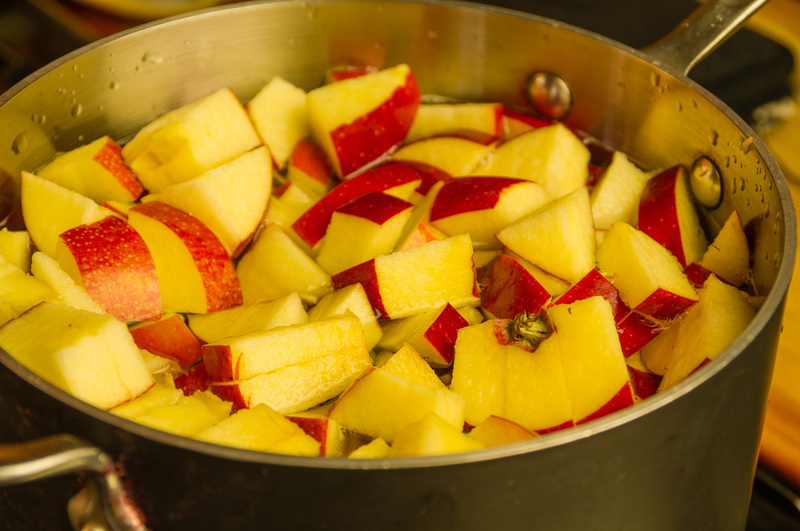 Reduce heat and simmer for 20 minutes or until apples are tender. 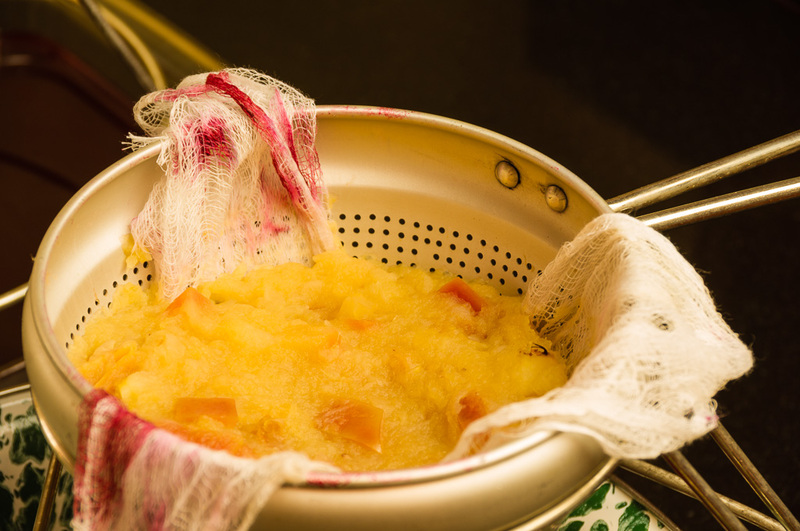 Place apples in cheesecloth lined strainer and leave for 30 minutes. Reserve juice and discard pulp. Measure the reserved blackberry and apple juice to 4 cups each. 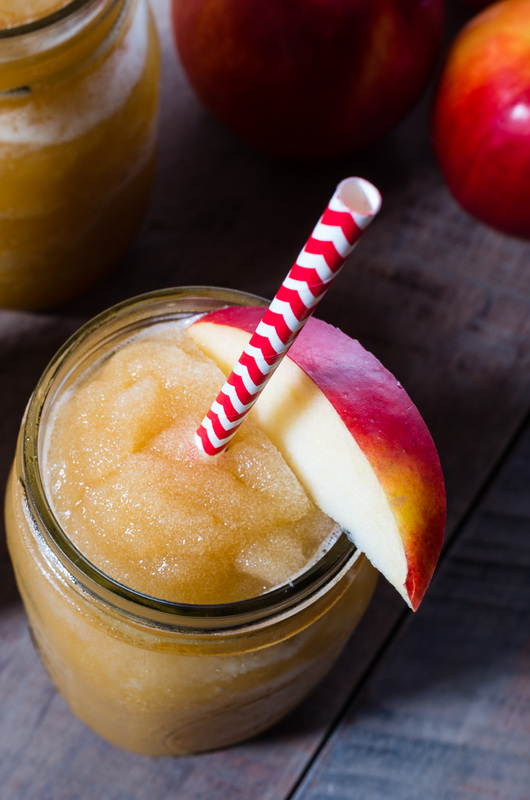 If necessary, add bottled apple juice to get to the 4 cups. Stir in lemon juice and sugar and mix until sugar is dissolved. Bring to a full rolling boil, stirring constantly. 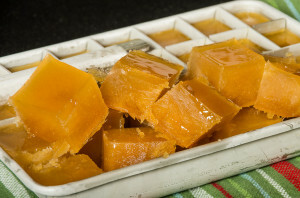 Stir in the two packets of liquid pectin; return to a full rolling boil. Boil for 1 minute, stirring constantly. Remove from heat; skim off foam. Ladle into hot jars, leaving a 1/4-inch headspace. Wipe the rims of the jar and adjust the two-piece cap. Process 10 minutes in a boiling water bath. 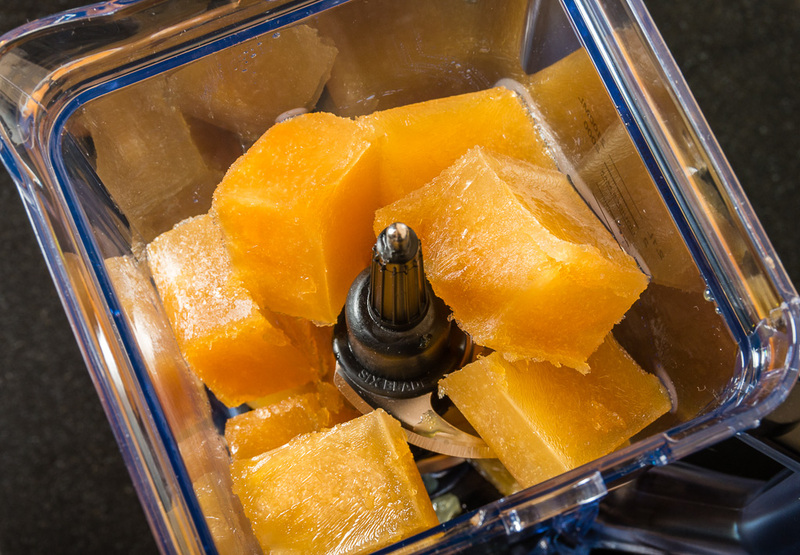 Remove jars from canner and set on a towel to cool. It is the first week in January and it is time to sort the apples I bought this past fall. 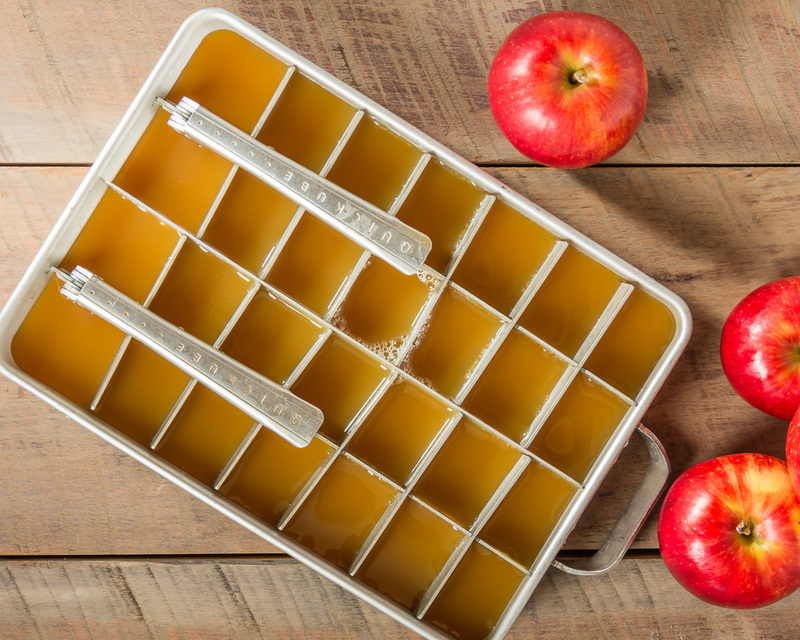 If you get the right type of apple you can keep them stored in your refrigerator for 4 to 6 months. I am coming up on the 4 month mark and need to use up some apples. 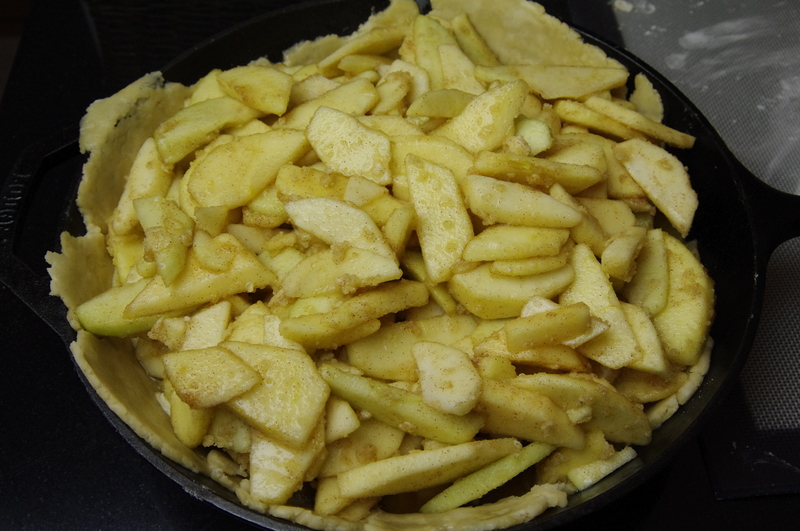 I pulled the rest of my Winesap, Empire, Granny Smith and Pinova apples out and had enough to make two apple pies. 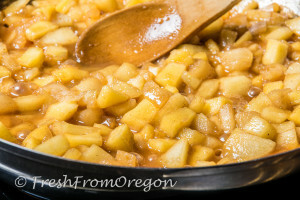 I have been wanting to try the Skillet Apple Pie I added to my Pinterest page last October so I pulled out my 12″ cast iron skillet (10″ is a normal size). I also made a small 8″ pie for the local fire department to enjoy. I had just pulled two hot apple pies from the oven as my husband walked by my kitchen, I think he smells them coming out and the only words he said was that is a giant pie! 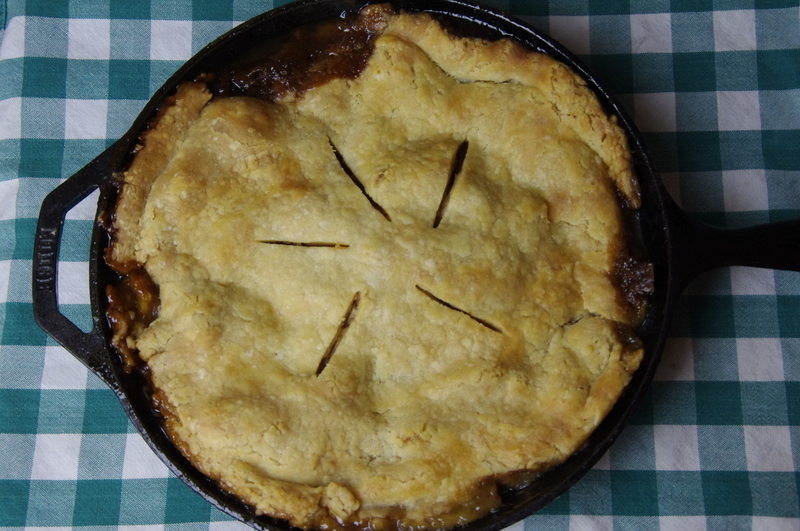 So clean out the refrigerator of your mixed apples or visit some local farm markets that still have a few apples left and make a skillet apple pie! Preheat oven to 350º. 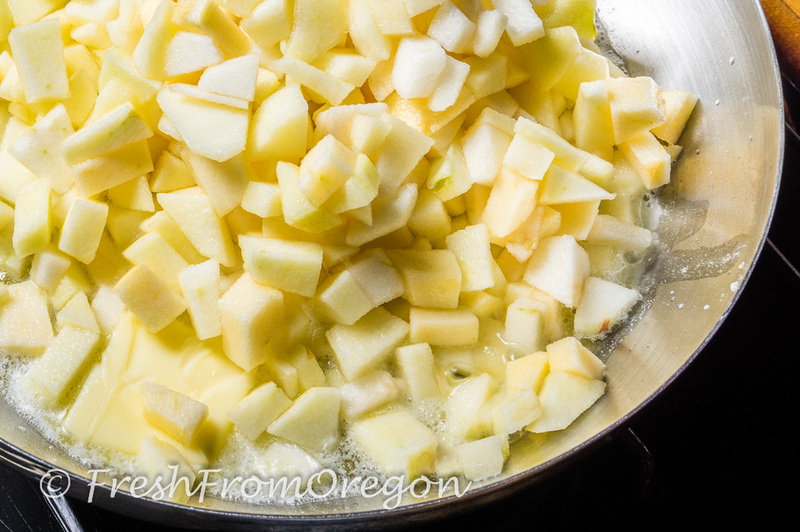 Peel apples, and cut into 1/2-inch-thick wedges. Toss apples with cinnamon and 3/4 cup granulated sugar. 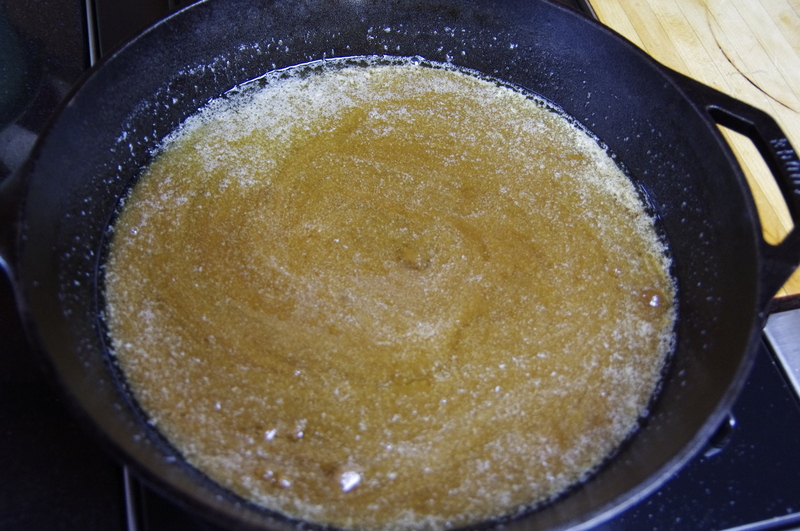 Melt butter in a 10-inch cast-iron skillet over medium heat; add brown sugar, and cook, stirring constantly, 1 to 2 minutes or until sugar is dissolved. 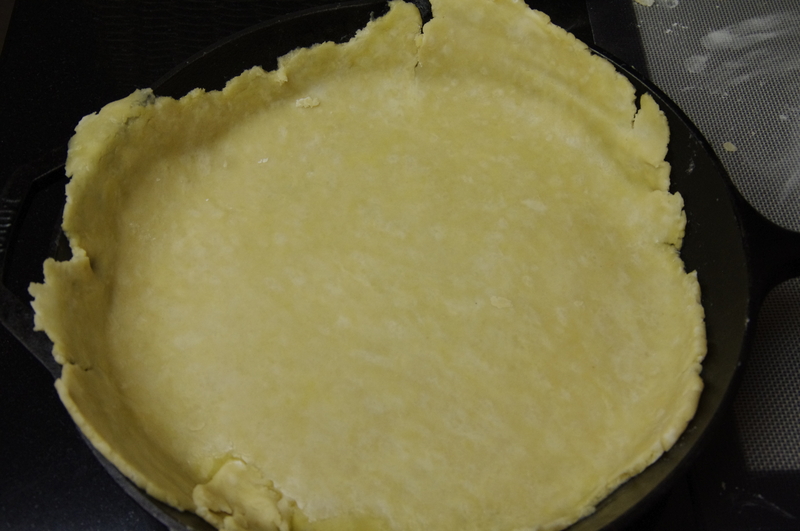 Remove from heat, and place 1 pie crust in skillet over brown sugar mixture. 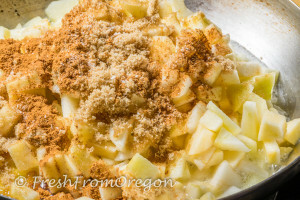 Spoon apple mixture over pie crust, and top with remaining pie crust. Cut 4 or 5 slits in top for steam to escape. I am not a big fan of egg and sugar on top of my pie it makes it a little hard and sweet but if you like it that way do the following. Whisk egg white until foamy. Brush top of pie crust with egg white; sprinkle with 2 tablespoons granulated sugar. Bake at 350º for 1 hour to 1 hour and 10 minutes or until golden brown and bubbly, shielding with aluminum foil during last 10 minutes to prevent excessive browning, if necessary. Cool on a wire rack for 30 minutes before serving. Serve with ice cream. 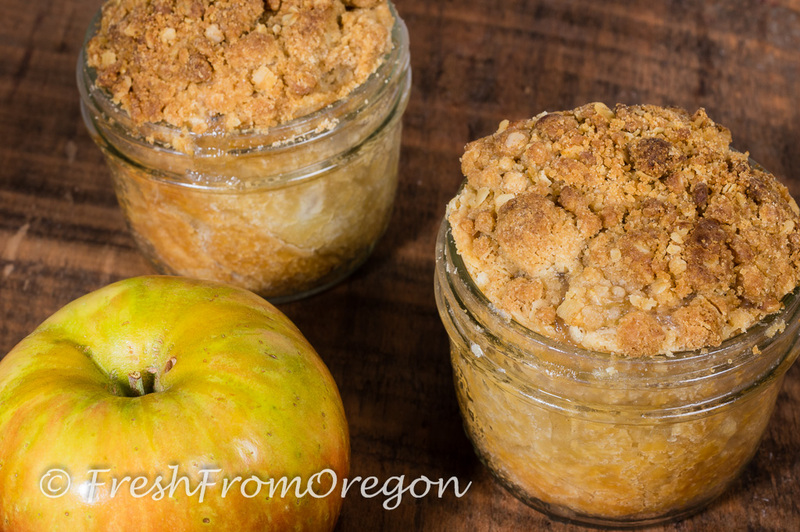 Each week new apples are being picked in Oregon and these are the three best apples for baking with this week. That list changes as we move through the season with varieties getting too ripe for good baking and new ones being picked. 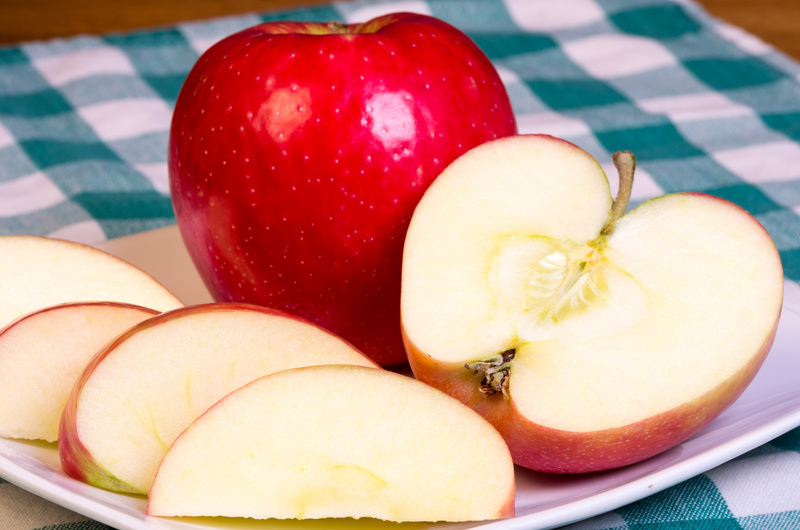 Honeycrisp – It is a medium to large apple with a white flesh that is crisp and juicy with a good balance of sweet and tart flavors. 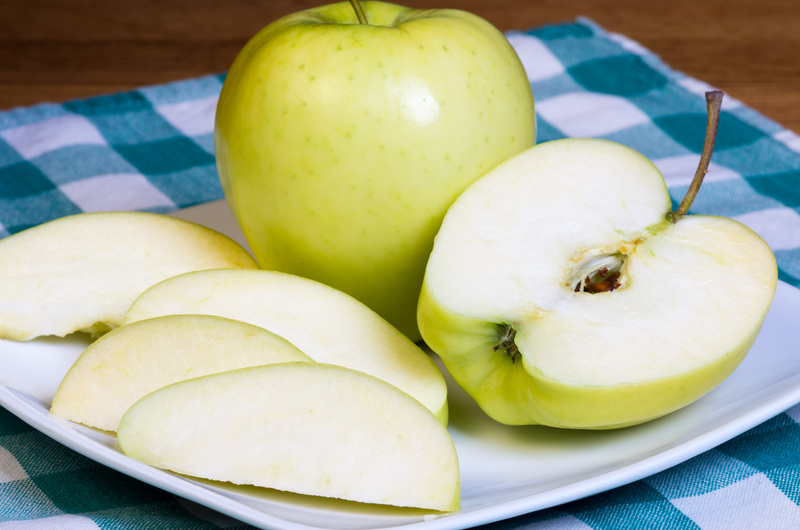 The University of Minnesota developed this apple from a cross between Macoun and Honeygold apples. This is a modern apple developed in the 1960’s and introduced to the market in the 1990’s. 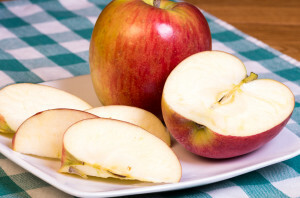 The Honeycrisp is a great keeper you can store at 32-38 degrees for 4 months. This is an all-purpose apple for me, I use it in cakes, pies and it makes the best dried apples. Ginger Gold – This is the best of the early golden apples. 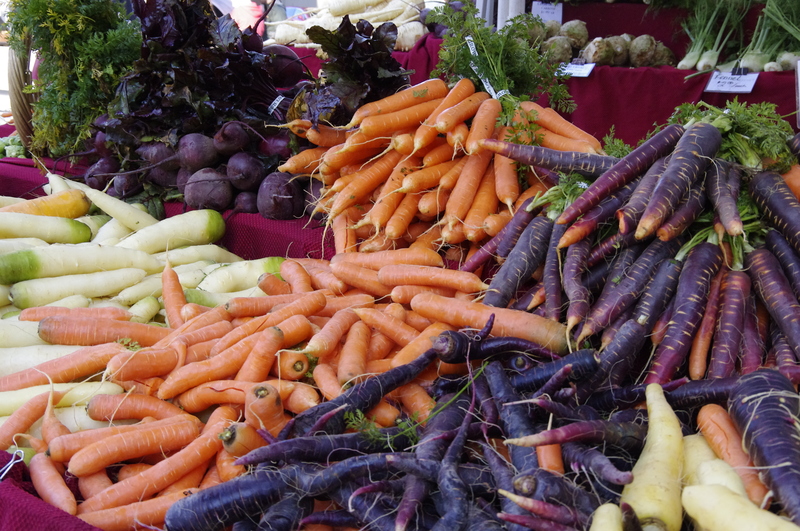 Its firm, crisp, juicy flesh is dripping with sweetness. The Ginger Gold was discovered as a chance seedling growing near a Golden Delicious orchard in Viginia in the 1960’s. 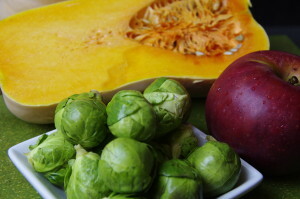 The color and shape looks like a Golden Delicious but it has a much earlier season ripening 6-8 weeks earlier. This apple is a short season apple only keeping 2 months at 32-38 degrees. This apple is great for eating, baking, pies and applesauce. Tsugaru – Yellow with red blush, the Tsugaru (SOO-GA-ROO) resembles Golden Delicious, but is much more firmer. It is a cross between a Golden Delicious and a Jonathan apple. 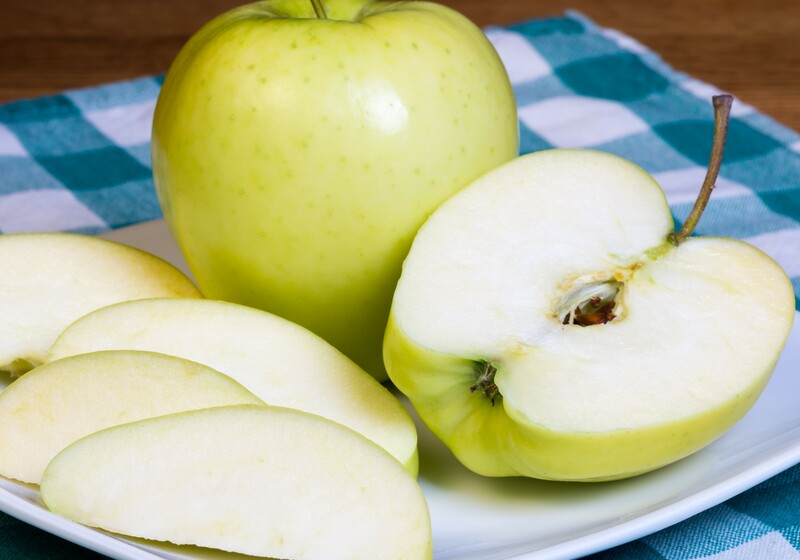 It is a medium size apple with a creamy white flesh, very juicy, lightly flavored, and moderately sweet with low acidity and very little browning. This apple is great for eating, baking, salads and pies. Heat oven to 350°F. Spray a 10-inch removable-bottom tube pan with nonstick spray. Sprinkle pecans evenly on bottom of pan. In a large bowl, mix 2 tablespoons of the flour, 1/4 cup of the sugar, and cinnamon. Add apples and toss to combine. In another large bowl, mix remaining flour, remaining sugar, baking powder, and salt. Add eggs, oil, butter, orange juice, and vanilla extract. 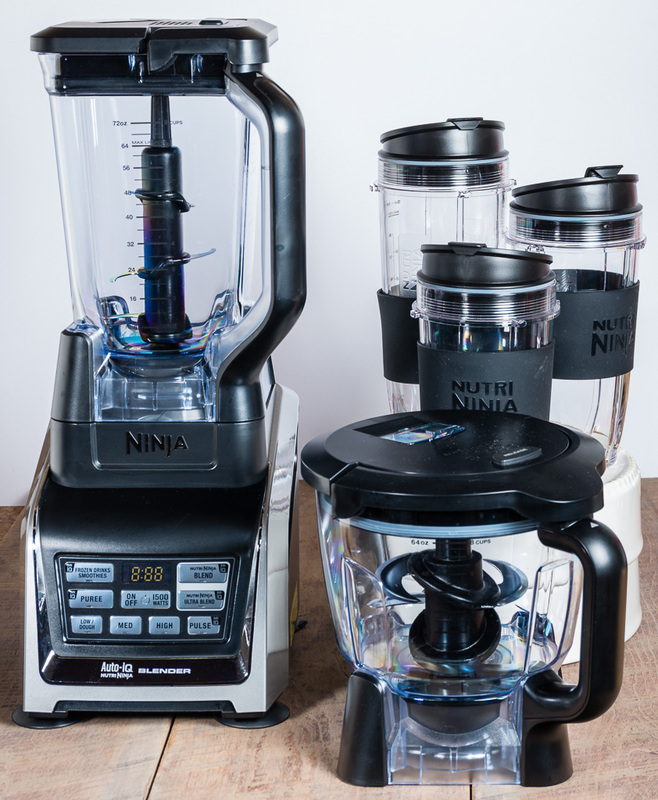 Beat until batter is smooth. Pour half of the batter (about 2 cups) into prepared pan. Top with half of apple mixture. Spoon remaining batter over apples and top with remaining apples, placing them 1/4 inch in from the tube and the border of the cake. Bake 1 hour and 20 minutes, or until a toothpick inserted in the center of the cake comes out clean. Let cake cool in pan on a wire rack for 30 minutes. Run a paring knife around the sides and center of cake and turn cake out onto wire rack. Invert cake onto another rack to cool, pecan side up. Apple season started weeks ago here in Oregon and after a trip to Kiyokawa Family Orchards & Fruit Stand in Hood River, Oregon my refrigerator is bursting with apples. I left with 9 varieties of apples and have several recipes ready to share with you over the next few weeks. The Apple Caramel Cake is a easy recipe to make, very moist and the frosting adds a great finish. 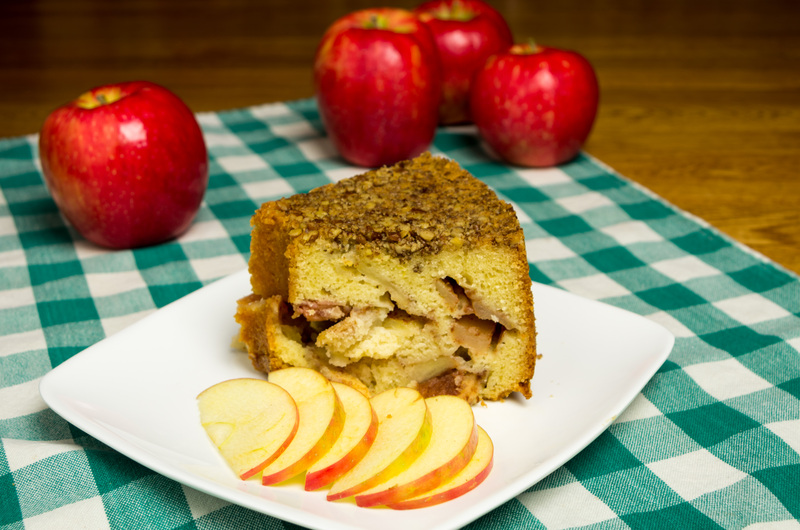 I like to use a nice sweet apple so I used Ginger Gold in this cake. Preheat oven to 350 degrees. 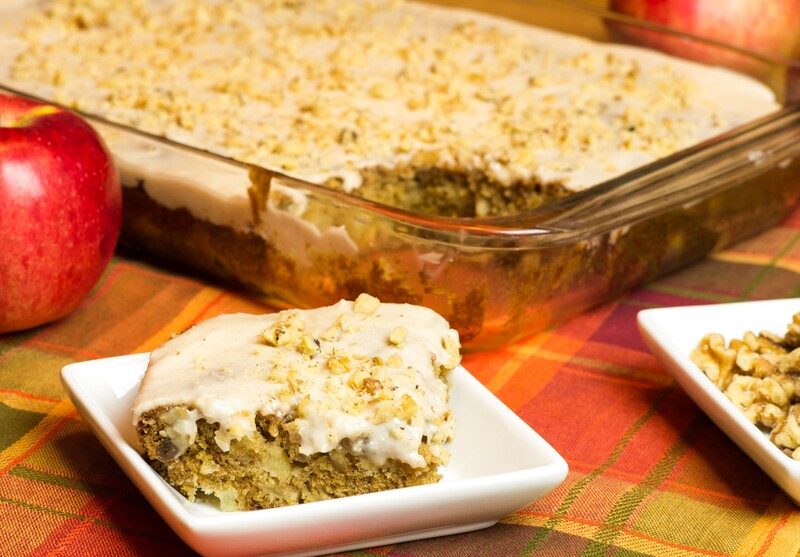 Grease a 13×9-inch baking pan, set aside. In large bowl combine flour, cinnamon, salt, baking powder and baking soda. In bowl of a mixer cream brown sugar and butter 2 minutes, add eggs and vanilla until combined. 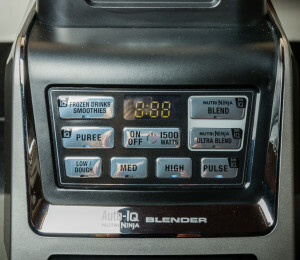 Add flour mixture, mix for 3 minutes on medium speed. By hand stir in apples, walnuts and raisins. Pour into greased baking pan. Bake at 350 degrees for 30-40 minutes or until toothpick inserted in the center comes out clean. Cool on rack. Frosting: In small bowl with whisk blend powdered sugar, cinnamon, butter, vanilla and milk. Add more milk if need to make spreading consistency. Spread over cool cake and sprinkle with nuts. What do you think of when you see an pan of slab pie on the table. I think of family reunions, church suppers and picnics. It is apple season here in Oregon and each week there are several apples coming into season. I wanted to take some of these apples and create something that I could share with friends. When you make a slab pie you are making two pies at once. 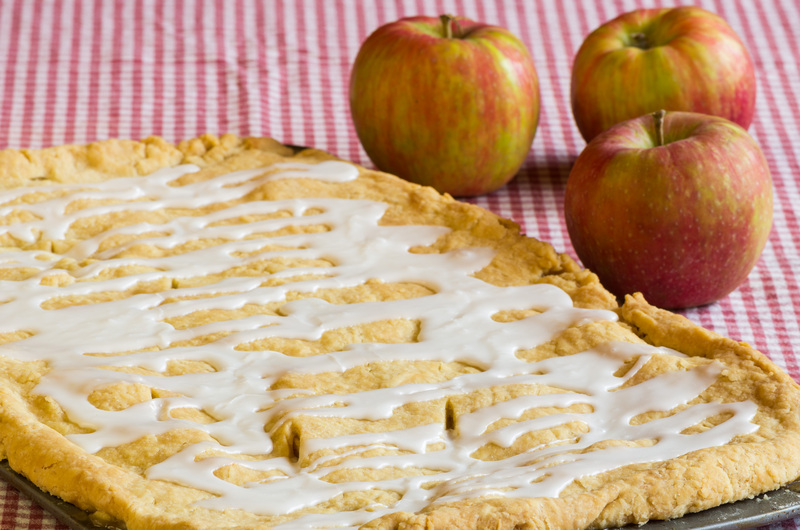 The flaky crust of the dough and the sweet filling of apples is a great way to start the fall apple season. In large bowl combine the flour and salt, add shortening and butter. 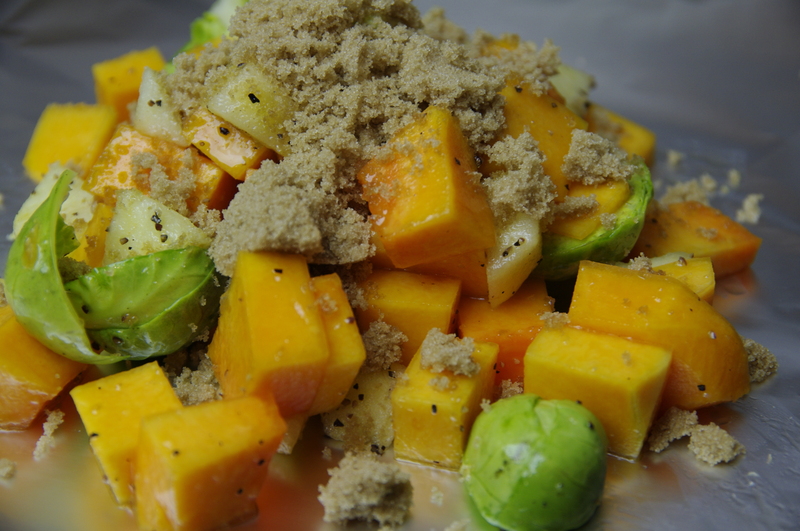 With a pastry blender mix together until the mixture resembles coarse crumbs, do not over mix. In a small bowl combine egg, cider vinegar and water, add to the flour mixture and combine until the dough just comes together in a ball. 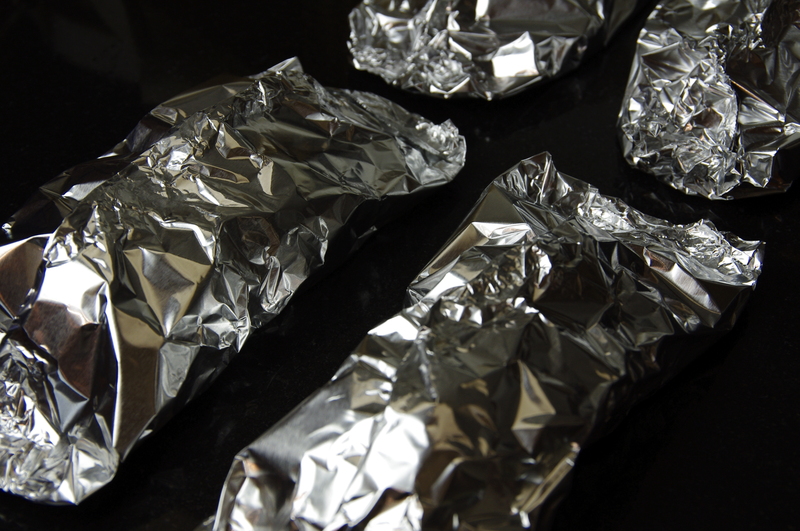 Wrap in plastic wrap and refrigerate for about 30 minutes to 1 hour to rest the dough. Make another batch of pie dough and repeat above. You will have two balls of dough when you are done. In large bowl combine apples, lemon juice, flour, sugar, cinnamon and butter. Set aside. Preheat oven to 350 degrees. 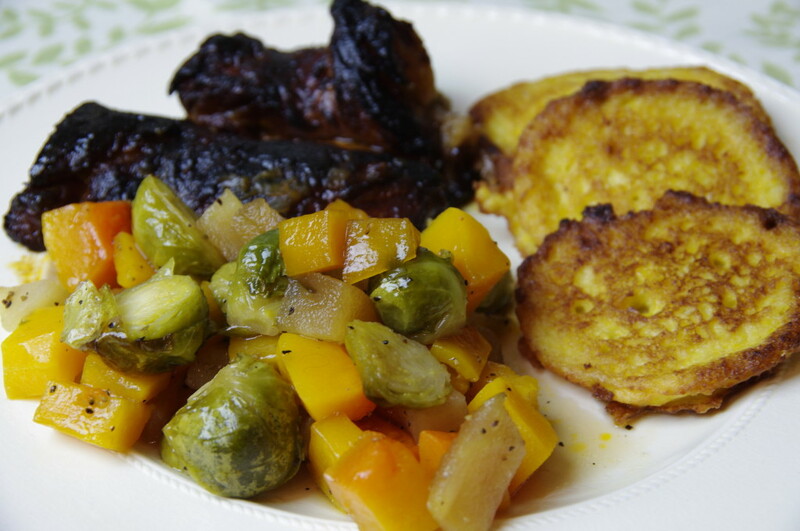 You will need a 10×15-inch baking pan. On a floured surface roll out one piece of the dough to fit in the bottom of the 10×15-inch baking pan. 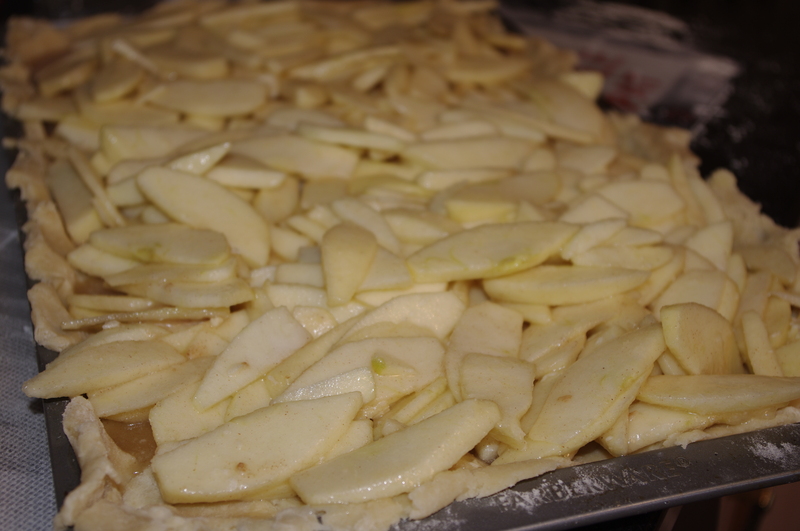 Place apple mixture over the dough spreading out evenly. 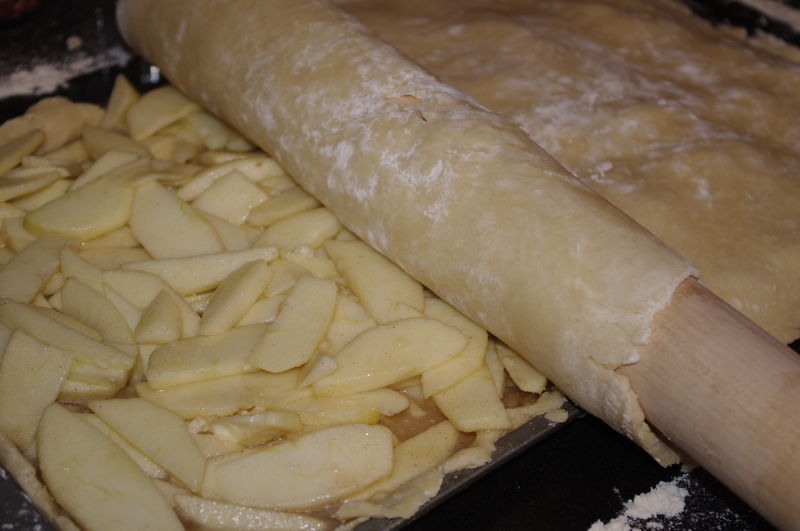 Take the remaining dough and roll out slightly larger to place over the top of the apples. Since the dough is so large to work with I use my large pasta rolling pin to do this. 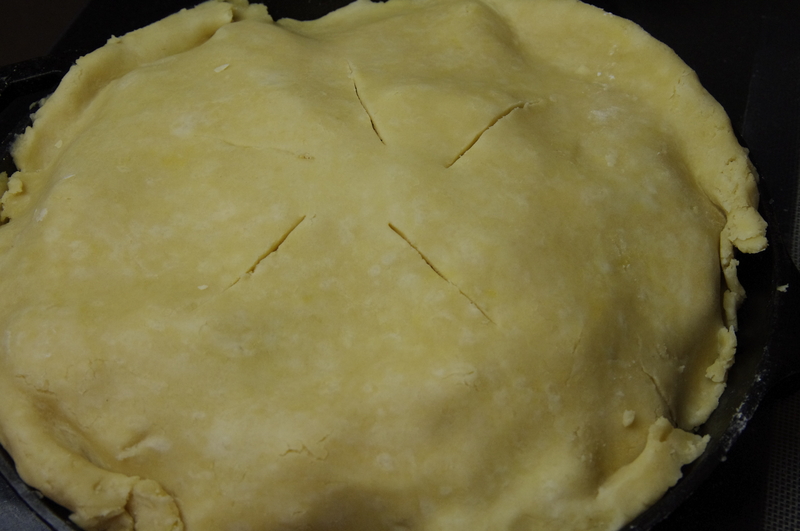 Roll the top dough under the bottom dough and cut some small slits in the top to vent the pie as it cooks. Bake in oven for 1 hour or until golden brown and you see the apple mixture bubbling up a little from the slits. Remove from the oven and cool on wire rack. Combine the confectioners sugar and milk in a small bowl and with a whisk combine until smooth and slightly thick. Drizzle over the pie. Washington State leads the nation in apple production and more than half of the fresh eating apples come from Washington. Red delicious representing 30% of apples grown. Washington has seven main production areas with Yakima Valley being the largest. 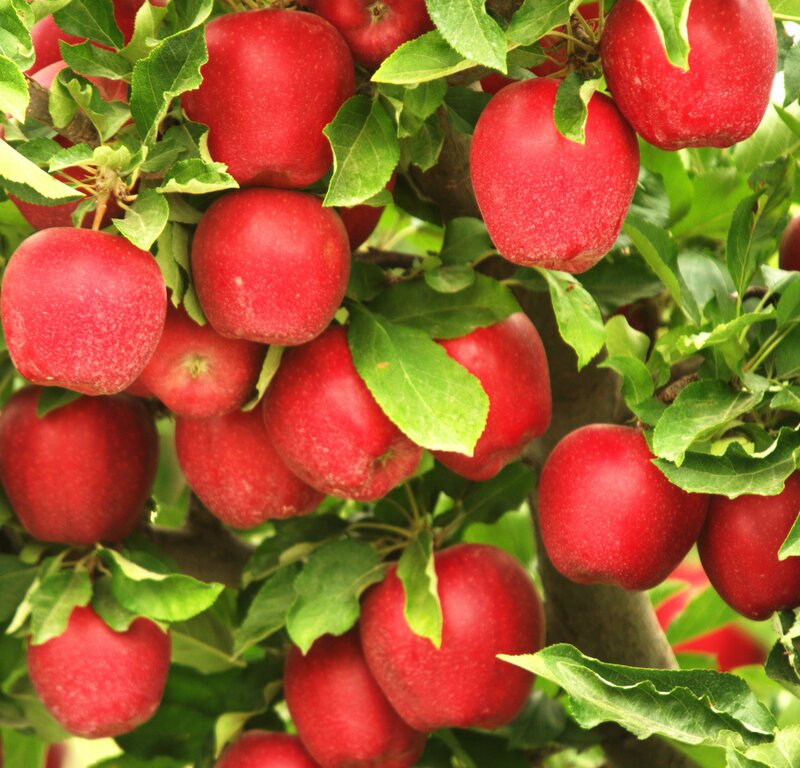 The Columbia basin area gives the state its famous Fuji apple. 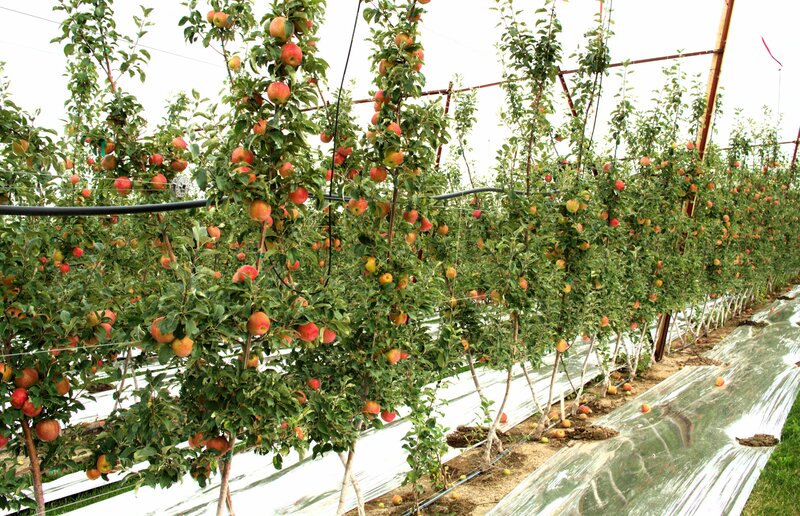 Growers now use “dwarf trees” in high density plantings to bring new orchards into production faster. 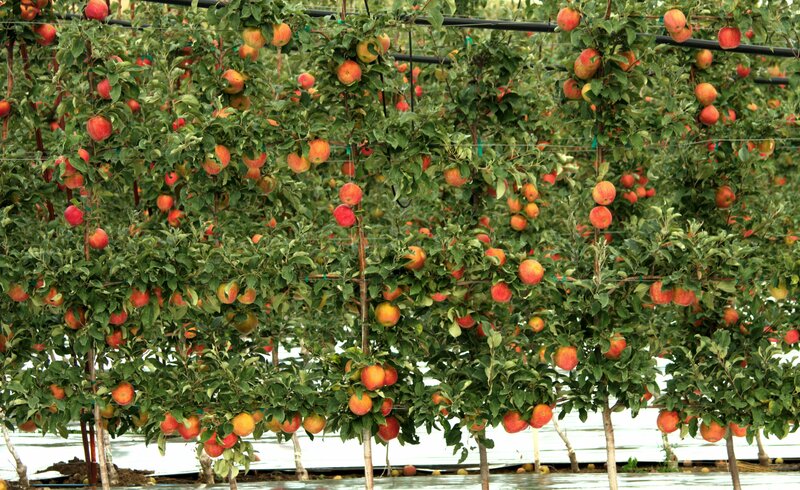 More than 175,000 acres of apple orchards are nested in the eastern foothills of Washington. 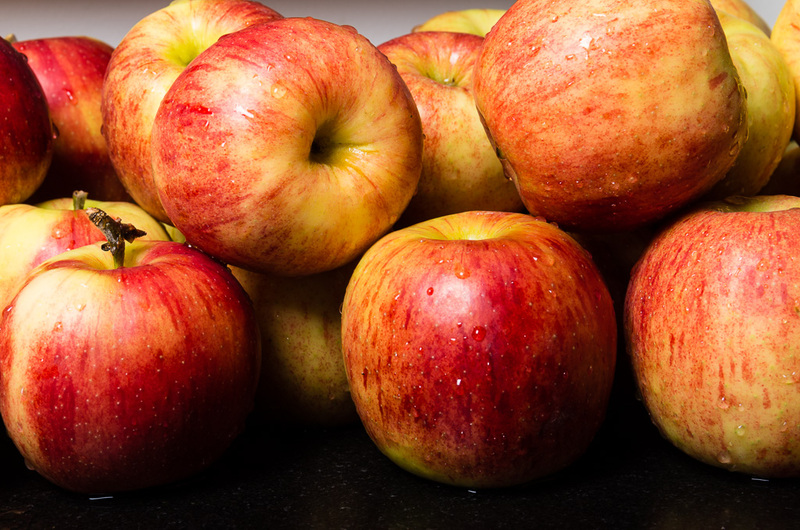 The following are the top nine apples grown in Washington State. 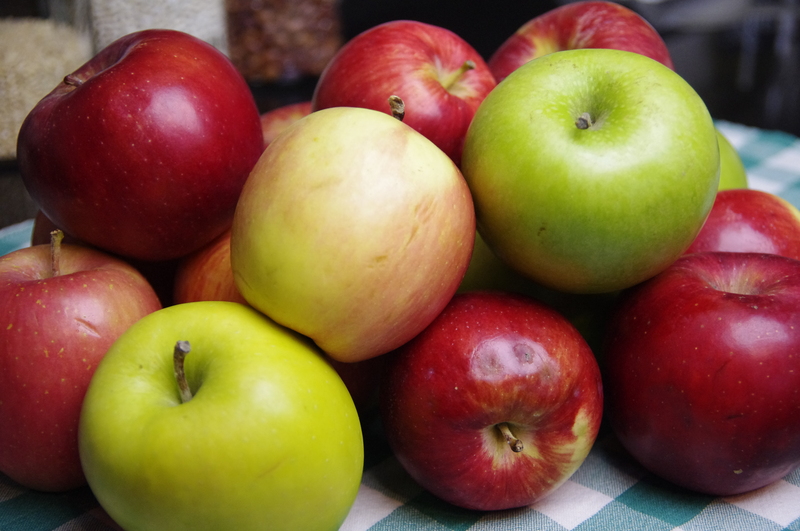 Red Delicious, Golden Delicious, Gala, Fuji, Granny Smith, Braeburn, Honeycrisp, Cripps Pink and Cameo. The picture to the right shows how the apples are grown on a trellis in a V-shape. Trees are planted 12 feet apart, with every other tree slanted in the opposite direction of its neighbor, in a V formation to meet at row center. They want fruit produced narrow, tall fruiting walls. The goals is for the trees to reach full height in two years.